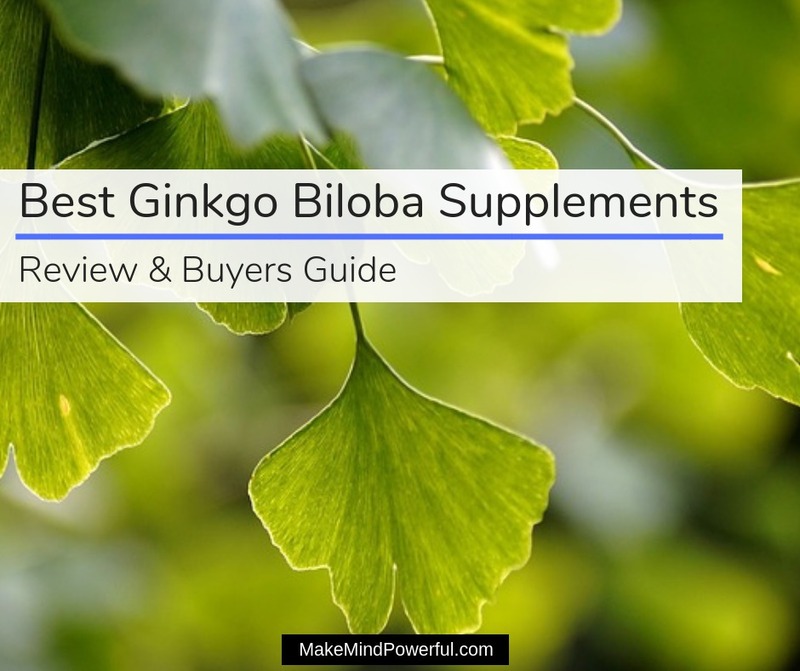 While the benefits of Gingko Biloba may be dated to ancient times, you’ll want to read this guide and review of the best Gingko Biloba supplements to truly understand its pros and cons. Gingko (Gingko Biloba) or maidenhair tree has various health uses. According to studies, the plant has been present for centuries with fossils dating back to 270 million years. It is a native plant to China and has been cultivated in ancient times. It has various uses in traditional medicine as well as a source of food. At present, the gingko leaf extract is already part of the supplement and cosmetic industry. Furthermore, as a food, roasted gingko seed with the pulp removed is an edible delicacy in China and Japan. Although the seeds and leaves of gingko are often vital components in traditional Chinese medicine, modern research mainly focuses on the extract which is made from the leaves. The supplements have a link with various health claims and uses, mostly focusing on blood circulation and brain function. There are several health reasons to include a Gingko supplement in your diet according to several studies throughout the years. Take a close look at this extensive list of the health benefits of the plant. Powerful antioxidant – The high content of antioxidants in Gingko is the reason for its health benefits. In one study, it contains high levels of terpenoids and flavonoids which are compounds known for their potent antioxidant effects. Antioxidants fight or neutralize the detrimental effects of free radicals. The free radicals can potentially damage the healthy tissues, contributing to accelerated aging and high risk for diseases. Helps fight inflammation – Gingko can lessen inflammation by various health conditions according to various studies. Inflammation is part of the natural response of the body to injury or invasion of foreign substances. Some chronic ailments trigger an inflammatory response even if there is no injury or illness. Over time, excessive inflammation can cause lasting damage to bodily tissues and DNA. Some of the conditions where gingko extract lessens inflammation include irritable bowel disease (IBD), arthritis, heart disease, stroke, and cancer. Improve circulation and heart health – The ability of Gingko to improve the blood flow to different parts of the body might be responsible for its health benefits. The protective effect on the brain and heart as well as prevention of stroke might be due to the anti-inflammatory compounds in the plant. Lessens signs of psychiatric ailments and dementia – For now, it is hard to conclude that Gingko can treat Alzheimer’s disease and other forms of dementia, but it can help in some cases. The effectiveness of the plant seems to increase if used with conventional treatment. In one study, the positive results might be due to the capability of the plant in improving the blood flow to the brain, especially with the vascular forms of dementia. Improve brain function and well-being – Using supplements can help increase mental performance and overall well-being. Although using Gingko can improve mental capability, there is no guarantee in all cases. Lessen anxiety – Some studies show that using Gingko can lessen the signs of anxiety which has a link to the antioxidant present in the plant. Treat depression – Gingko can help manage depression due to the anti-inflammatory properties of the plant. It helps improve the ability of the body to cope when the levels of stress hormones are high. Support vision and eye health – Using Gingko supplements can help increase the flow of blood to the eyes, but this will not necessarily improve vision. Further study is necessary to determine if the plant can increase vision or slow down the progression of degenerative eye diseases. Treat headaches and migraines – In traditional Chinese medicine, it is a common option in treating headaches and migraines. This is due to the ability of the plant to improve the blood flow by dilating the blood vessels and lessen inflammation. In case a headache or a migraine is due to excessive stress, gingko might be beneficial. Improve asthma and COPD symptoms – Gingko can improve the signs of asthma and other inflammatory respiratory ailments such as COPD. The anti-inflammatory compounds in the plant help lessen inflammation of the airways and improve the lung capacity. Reduce PMS symptoms – Gingko can help lessen both the physical and psychological symptoms of premenstrual syndrome (PMS) but further research is necessary. Treat sexual dysfunction – The plant has the capability to improve the blood levels of nitric oxide which improves circulation by dilating the blood vessels. In studies, gingko can treat sexual dysfunction such as low libido or erectile dysfunction. In most studies, the purified gingko extract is used. Remember to avoid eating the raw gingko seeds since they are poisonous. At present, there is no specific maximum dosage, but it is recommended to start with a lower dose and steadily increase to ensure tolerance. Generally, it might take up to 6 weeks before noticing any effects. Consult a doctor first before including gingko supplements in your daily routine. Among adults, the risks with using gingko are relatively low but there are instances where it can cause significant harm. If you are allergic to plants that include alkylphenols or using certain medications, do not use any supplement. Even today, there is no standard dosage for Gingko supplements. In most cases, regardless of the reason why you are using gingko, start at a low dose of 120 mg daily and steadily increase. If in doubt, consult a doctor. Selecting the right gingko supplement depends on the tolerance level of the individual and health conditions. 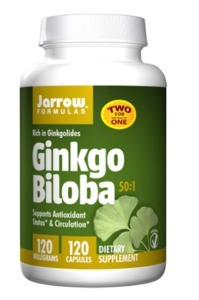 Gingko Biloba is available in pill, liquid or powder form or as a tea. At present, the ideal form of gingko supplements is in tablet form due to the potency of the ingredients that circulate in the blood which is more effective than the capsules. The time-released capsules might be a better option for individuals who are sensitive to the supplement in large amounts. Teas are also less effective as well as energy drinks and nutrition bars. Check for supplements with the standardized Gingko Biloba extract (GBE) from leaves of the plant. Using the non-standard parts of the tree such as fruit, leaves, and seeds are discouraged since they did not undergo the clinical assessment for effectiveness. Remember that it is dangerous to consume the seeds and fruit. The supplement should include lower than 5 parts per million (PPM) of ginkgolic acid. In one study, this is a poison or toxin, possibly both a carcinogen and allergen like those found in poison ivy which can trigger serious reactions. There are several gingko suppliers online and offline to choose from. 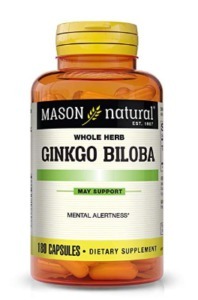 For comparing the various brands of Gingko Biloba supplements in an easy manner, Amazon is a good place to start. There are also reviews by other buyers to check out to find the right one for your needs. There are several choices of gingko supplements available online. Choosing the right one can be a tedious task especially selecting the best from the rest. Here is a list of the top supplements to choose from. Nature’s Bounty products have been the top choice for health-conscious individuals for many years. With the combination of the latest breakthroughs in nutrition science and the best ingredients, the supplements ensure unrivaled value and quality with the supplements they provide. Strict quality tests during the manufacturing process ensure purity and potency of the products. 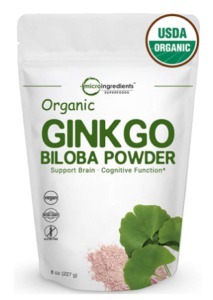 A decline in cognitive function is an unavoidable process especially the loss of focus and forgetfulness but taking Nature’s Bounty Gingko Biloba provides an additional boost to mental functions. This supplement enhances the brain to improve cognitive processes and mental clarity. It is also useful in avoiding intermittent memory lapses which is part of the aging process. The beneficial properties of gingko nourish the brain cells to improve the functioning processes. Aside from the improvement to the brain function, gingko contains antioxidants to fight free radicals as well as improving the circulation throughout the body. The capsules work best if ingested together with foods ideally during breakfast, lunch or dinner. Promote healthy brain functioning during old age. Improve cognitive reasoning ability, focus, and concentration. Antioxidant properties to fight free radicals. May not be effective for some individuals. The wide array of products by Nutricost ensure top quality and value to cater every need to achieve optimum health. The supplements by Nutricost are manufactured using only the purest forms of the exact ingredients in dosages that will help one perform at their best. High standards on manufacturing and quality control are strictly implemented to ensure only the best supplements to cater to the needs of every health-conscious individual. 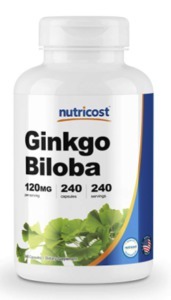 Nutricost Gingko Biloba offers a concentrated dose of premium gingko extract that provides the body with a variety of benefits. The addition of this supplement in the daily routine can help improve blood flow and oxygen use in the brain to improve cognitive function and lower the risk for dementia. The supplement boasts its extra strength to provide the ideal combination of flavonoids and terpene lactones isolated from the Gingko Biloba leaves to achieve the best results. If taken as a dietary supplement for an additional boost to your overall health, take one capsule a day, preferably with a meal. Improves brain function. Antioxidant properties to fight free radicals. 3rd party tested for safety and purity. Costco’s TruNature products are used by millions of individuals all over the globe to maintain a healthy lifestyle. TruNature provides a variety of health supplements at affordable prices with fast delivery at your door. All products and supplements are made using all-natural ingredients. You are in good hands since there are no man-made artificial or chemical components that can disrupt the natural equilibrium of the body. 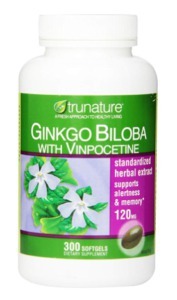 This highly beneficial supplement by TruNature is an herbal formulation with 2 main components – Gingko Biloba and vinpocetine. Gingko helps enhance memory and concentration while vinpocetine functions as a vasodilator to enhance blood flow in the brain as well as providing neuroprotective properties. Among adults and elderly, it has been used as a treatment for aging-related memory issues and helps in the prevention of cerebrovascular ailments. Affordable price for a bottle containing 300 soft gels. Main active ingredients were under various clinical testing and studies. Contain vinpocetine which increases the absorption rate. Some individuals experienced side effects. With the variety of supplements in the market, you should check out the supplements by TR supplements. The True Recovery supplements are manufactured in Good Manufacturing Process (GMP). All products are readily available over-the-counter dietary supplements which undergo high-quality testing to ensure the best. The manufacturing and packaging are under facilities registered by the FDA. The supplements aim to provide a healthy boost in life by catering to various needs of every individual. The Gingko content provided by this supplement has a variety of benefits, especially with the cognitive function. Some of these benefits include improved memory, mental sharpness and blood flow to the brain. Along with the added 100 mg coconut oil, it facilitates proper absorption of gingko in the body. Among older adults, this supplement is a must-have since it alleviates cognitive decline which is part of the aging process. 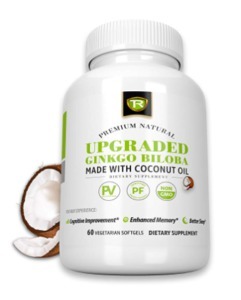 Includes 100 mg organic coconut oil for optimum absorption of gingko. Non-GMO, gluten-free and manufactured in cGMP compliant facility. Mason Vitamins provides a variety of supplements that only contain the purest and highly potent ingredients. The main priority of Mason Vitamins is to ensure top quality, affordable and safe products for the entire family. All products are manufactured and undergo thorough testing with updated machinery and laboratories that are cGMP compliant. 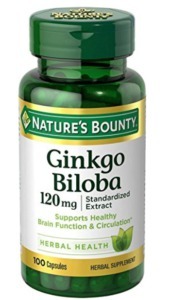 Aside from improving the cognitive brain function, this Gingko Biloba supplement is an ideal addition to your diet. With 500 mg of gingko in each capsule, it provides a variety of health benefits. When using this supplement, the body is given the double amount of potency in a single serving. If you want to improve cognitive function, this supplement is a great option. Since it promotes circulation to the brain and other parts of the body, it also boosts concentration and improves memory. Contains natural and the finest herbal ingredients. No artificial flavors and preservatives. Gluten-free and soy-free. With the top-quality products by Micro Ingredients, you have the best products at affordable prices. All the products used are high in quality along with the latest technology. The raw materials are converted into its purest form of powder without losing any flavor and nutritional value. The ingredients in the supplements are USDA Organic, free from additives and fillers, vegan-friendly and non-GMO. With this concentrated powder, it is rapidly absorbed by the body and easy on the stomach. The powder can be blended into beverages for a delicious and healthy smoothie or protein shake. A scoop is included to get the perfect measurement with every use. Improves cognitive functions such as focus, memory, mental performance, and concentration. 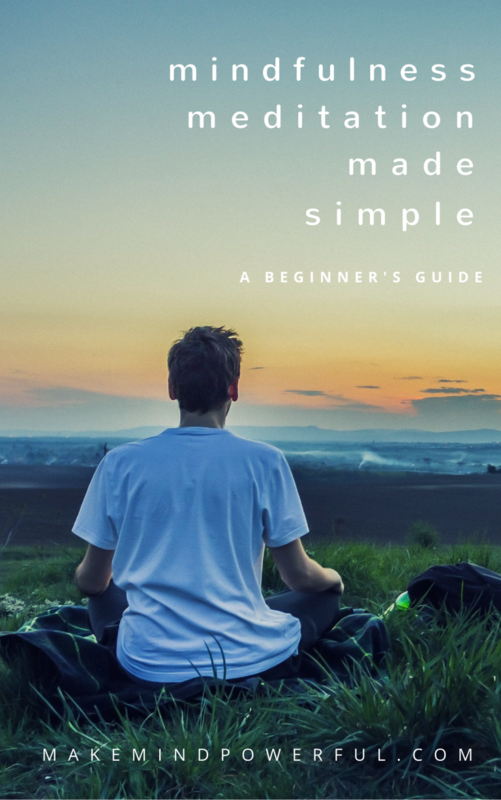 Improve mood, relieves stress and fights depression and anxiety. 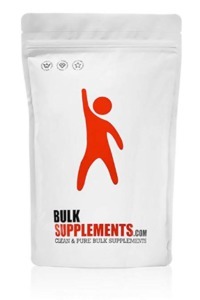 Bulk Supplements has over 400 nutritional supplements enjoyed by millions of consumers all over the globe. All supplements undergo manufacturing and distribution in FDA-registered facilities with cGMP compliance. Every supplement is tested in updated laboratories before distribution to ensure safe consumption. Adding a supplement to your routine can help achieve a healthy lifestyle. With this form of gingko, you have a variety of health benefits to enjoy. Aside from reducing the damage from free radicals, it is beneficial to brain health. Gingko contains terpenoids and flavonoids which have potent antioxidant properties that help prevent age-related cognitive decline. There is also an effect on circulatory health to enhance mental performance. Some of the effects include an improvement in sexual health and mood as well as reducing mental fatigue and relief from headaches. Free from soy, sugar, dairy, gluten or additives. Comes in a resealable bag to maintain product freshness and integrity. Rapid-acting. After mixing with any beverage, the product only takes 30 minutes up to an hour to take effect. Jarrow Formulas produce a variety of products including vitamins, minerals, enzymes, amino acids, probiotics, enteral nutrition products, and standardized herbal concentrates. With a global reach of these products, they ensure a healthy boost to life. Only high-quality ingredients and state-of-the facilities are used to produce these supplements to ensure top quality at a good price. The gingko supplement by Jarrow Formulas is a dietary formula designed to provide circulatory and antioxidant support. This formula also supports concentration, memory, focus and other cognitive abilities. Free from gluten, wheat, dairy, soy, egg, tree nuts, fish/shellfish, peanuts, and other allergic substances. Increasing levels of neurotransmitters such as enzymes and hormones. Some individuals do experience positive effects. Swanson Health provides vitamins and supplements supported by extensive research to deliver health and wellness solutions to individuals of all ages. The variety of products can help improve vitality at any age along with other health benefits. The formulas undergo strict testing to ensure quality for purity and potency. All facilities are Good Manufacturing Practices (GMP) certified. 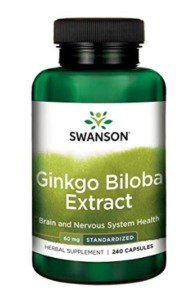 The gingko supplements by Swanson is an ideal supplement if you want a boost to brain health. The extracts of gingko leaves have long been used to support memory and mental sharpness. The extract is standardized to include 24% flavone glycosides and 6% terpene lactones for high potency in every capsule. This is the ideal supplement if you need a boost on brain function or minimize age-related cognitive decline among older adults. Additional support for memory and mental alertness. Manufactured with strict GMP guidelines. Standardized to include 24% glycosides and 6% terpene lactones. Best Naturals aims at providing top quality and innovative food-based nutritional supplements to individuals of all ages. By taking into consideration the modern lifestyle, the company has an objective to make a difference in health and well-being of consumers by providing high-quality vitamin and dietary supplements. All products are manufactured in a cGMP compliant environment. This gingko supplement by Best Naturals boasts a variety of health benefits specifically with brain health. The active ingredients that support cognitive health among older adults and healthy circulation are flavone glycosides and terpene lactones. This supplement fights the signs of aging by improving vision, alertness, and memory. If you want to gain the benefits it provides on brain health, take a capsule once or twice a day with or without food. Double strength potency to achieve maximum health effects. Standardized to include 24% Gingko flavone glycosides. 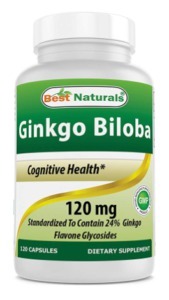 I hope that you’ve found the ideal ginkgo bilobal supplement from this guide for your health.